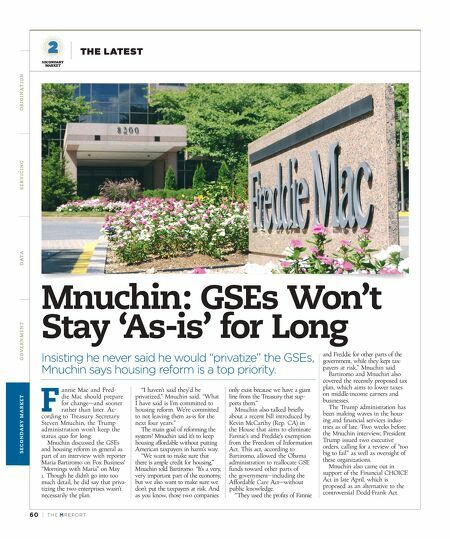 60 | TH E M R EP O RT SECONDARY MARKET THE LATEST O R I G I NAT I O N S E R V I C I N G DATA G O V E R N M E N T S E C O N DA R Y M A R K E T Mnuchin: GSEs Won't Stay 'As-is' for Long Insisting he never said he would "privatize" the GSEs, Mnuchin says housing reform is a top priority. F annie Mae and Fred- die Mac should prepare for change—and sooner rather than later. Ac- cording to Treasury Secretary Steven Mnuchin, the Trump administration won't keep the status quo for long. Mnuchin discussed the GSEs and housing reform in general as part of an interview with reporter Maria Bartiromo on Fox Business' "Mornings with Maria" on May 1. Though he didn't go into too much detail, he did say that priva - tizing the two enterprises wasn't necessarily the plan. "I haven't said they'd be privatized," Mnuchin said. "What I have said is I'm committed to housing reform. We're committed to not leaving them as-is for the next four years." The main goal of reforming the system? Mnuchin said it's to keep housing affordable without putting American taxpayers in harm's way. "We want to make sure that there is ample credit for housing," Mnuchin told Bartiromo. "It's a very, very important part of the economy, but we also want to make sure we don't put the taxpayers at risk. And as you know, those two companies only exist because we have a giant line from the Treasury that sup - ports them." Mnuchin also talked briefly about a recent bill introduced by Kevin McCarthy (Rep. CA) in the House that aims to eliminate Fannie's and Freddie's exemption from the Freedom of Information Act. This act, according to Bartiromo, allowed the Obama administration to reallocate GSE funds toward other parts of the government—including the Affordable Care Act—without public knowledge. 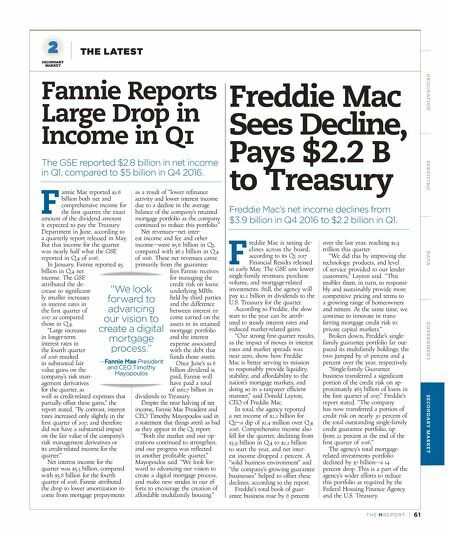 "They used the profits of Fannie and Freddie for other parts of the government, while they kept tax - payers at risk," Mnuchin said. Bartiromo and Mnuchin also covered the recently proposed tax plan, which aims to lower taxes on middle-income earners and businesses. The Trump administration has been making waves in the hous - ing and financial services indus- tries as of late. Two weeks before the Mnuchin interview, President Trump issued two executive orders, calling for a review of "too big to fail" as well as oversight of these organizations. Mnuchin also came out in support of the Financial CHOICE Act in late April, which is proposed as an alternative to the controversial Dodd-Frank Act.